We've teamed up with the stunning New Inn at Appletreewick, and are offering two lucky people the chance to win a fabulous 2 night break away in the stunning Yorkshire Dales, the prize also includes a bunch of flowers and a bottle of wine. The New Inn is a beautiful ancient Inn which is situated in the delightful Yorkshire Dales village of Appletreewick which is a real haven for walkers, cyclists, and couples looking for peace and solitude. 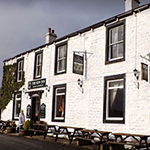 The New Inn offers true Yorkshire Dales hospitality, serving mouth-watering traditional dales home cooked food, and a wide selection of ales. Allow WOTR to send you offers. Allow sponsor to send you offers. Allow third parties to send you offers. The prize is 2 nights for two people (sharing a room) and includes Breakfast, and a bottle of wine. The winning entry will be drawn at random and contacted by a member of Way of the Roses.